These cute little trees are not my original creations. I've seen a lot of these out and about in stamping communities and thought I'd give them a try. 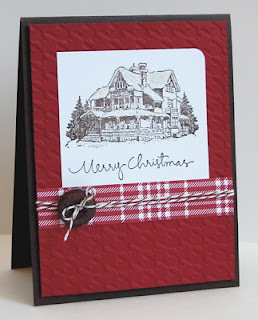 They are perfect additions to CAS cards, as well as tags and scrapbooking layouts. Cut your circle in half. Using your bone folder, folder the rounded edge of your circle across the straight edge. Fold again in the opposite direction. You will have some extra toward the top, fold that behind your tree and snip the extra. Trim a 1/4 x 1 inch strip of your brown scrap and adhere to the back of your tree. Now that we've made it past Thanksgiving, it's the final stretch to Christmas! YIKES! I'm not sure how many more cards I need to make to finish up, but I know that I'm not close yet!!! Expect lots more Christmas in the coming weeks! Using this weeks CAS Sketch (CAS146) at Splitcoast, I came up with this adorable Christmas card using a non-traditional color combo of Baja Breeze, Pretty in Pink and Crumb Cake. The Fair Isle Background combined with the mittens from Warm Wishes reminds me of baby blankets and sweaters my Gramma used to knit. 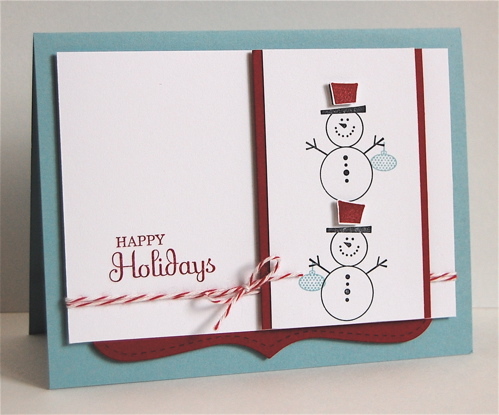 To add a little more softness to the overall feel, I did some sponging on the card base using Fresh Snow ink. 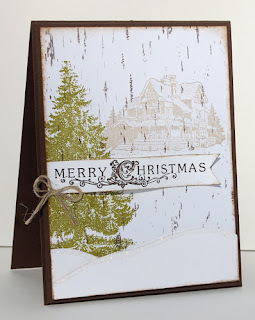 This is my favorite technique lately, using the negative portion of a die cut or stamp!! It just so happens to also be this weeks CAS Challenge at The Outlawz. 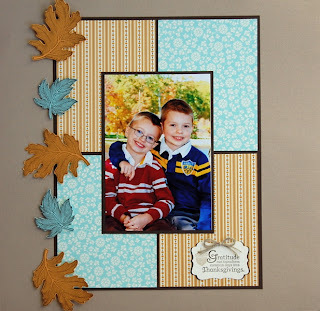 I started my card by die cutting the frame from Fillable Frames #4. I then stamped the front and adhered a 4 x 5 1/4 inch white panel to the interior. 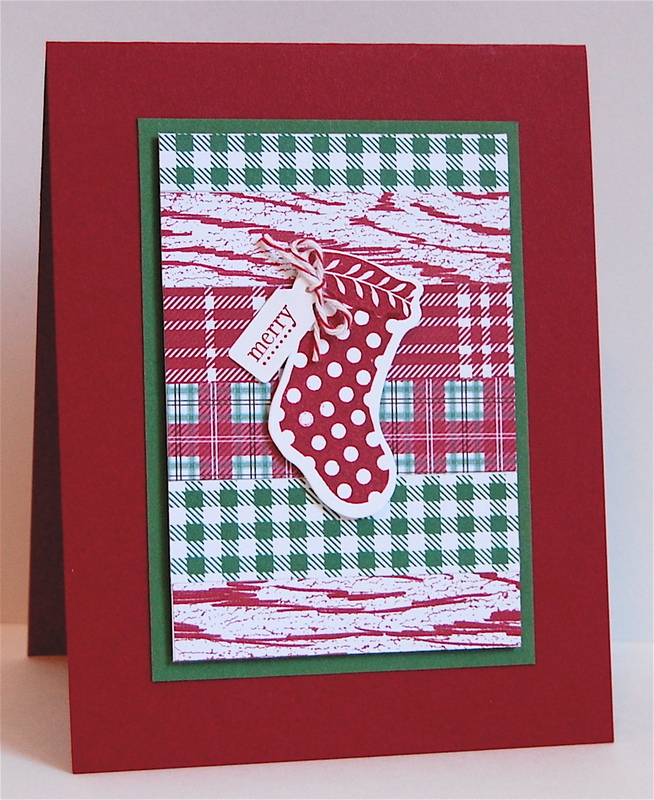 With the card closed, I stamped the frame and sentiment, then attached the stocking. The addition of the white satin bow was the finishing touch! Do I ever have a treat for you today! 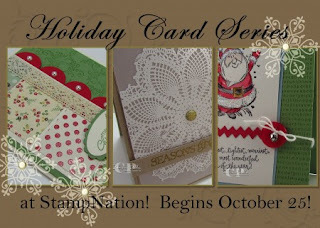 I get to share one of the StampNation Holiday Card Videos with you right here on my blog. If you've been wondering what it is all about, here it is!!! This video, along with over 100 more, is what you get at StampNation. Not only that, but over 5,000 samples in the gallery and tons of chatter. I am telling you, NOW is the time to join. Seems like I took an unexpected vacation from blogging. After a fabulous weekend of crafting, this week has been insanely busy with no time to photograph my projects or blog until now. All I can say is TGIF! On to my project...this sweet pair of boys belong to me, I'm so blessed. I took this photo last fall for our Christmas cards. 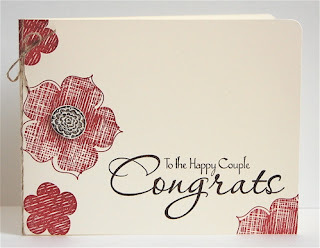 I paired it with some Spice Cake dsp and the stamp sets Autumn Abundance & Day of Gratitude. Instead of putting this right into an album, I have it displayed for Thanksgiving. I am attempting to make a new layout for each season/holiday to display in my house. I think it will help me to reach my scrapbooking goals for 2012, which I've talked about on StampNation. Myself, Catherine and some of the members are encouraging & supporting each other to get scrapping in 2012!!! Want to join us? It's an awesome time to join! Catherine has absolutely flooded the forum with Holiday projects, so many that I haven't gotten a chance to watch them all yet. I think it's creeping up to 120 videos in all! Wow! Have you been over to The Outlawz yet today? The new CAS challenge is up and it's sure to get your mojo flowing on this Sunday morning...Use your favorite patterned paper on a CAS card. The hardest part of this challenge is going to be choosing your favorite! For me, the decision was a no-brainer! I'm loving the Frostwood Lodge dsp right now. I used several of the patterns and made my background panel! 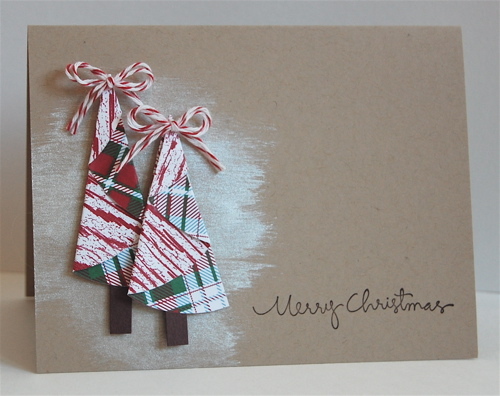 Now, grab your favorite paper and get crafty! All of this mass producing I have been doing has been stifling my creativity!!! Last night I finally got some time to be crafty. While my supplies were out I made 2 cards using the CASE Study #65 as inspiration! 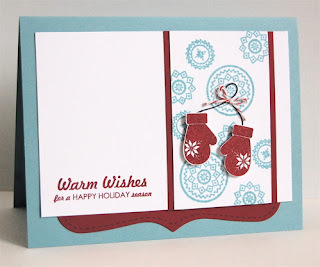 My first card uses Wplus9 Winter Wishes. I love those mittens! I'll be back later with all of the nitty gritty details! I know I said I was too busy to check in here this week, but SURPRISE, I'm here :) We posted the newest challenge today on StampNation...Stamp on dsp! 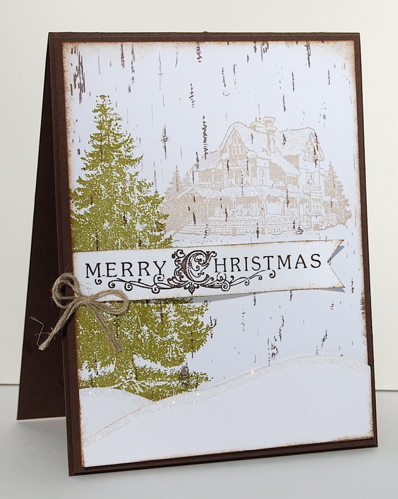 I used my beloved Christmas Lodge and Frostwood Lodge dsp for this. Don't you love the tree in the foreground and the lodge in the background? This is not my original idea, I did see this elsewhere and filed it away for inspiration! My husband thought it was brilliant, I fessed up to him too!!! Click here to join us at StampNation! If you join, don't forget to say hi! My screen name is MamaMo. I am in major mass production mode here...Christmas, Engagement & now 40th Birthday invites! Yikes!!! I'm not going to be around much this week, at least not until I get all of these cards assembled and delivered. I did want to drop in quickly though and share this card. I'm making these invites for a coworker of my husband's. She asked for something with a race car theme...hmm, in the stamping world, I had a hard time finding something appropriate for a grown man. So, I used some of the other info she supplied me with...the colors of his race car, strips & tire tread. 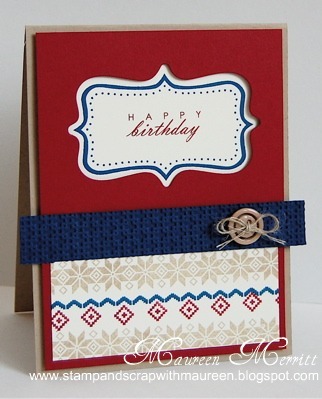 I was SO excited when I discovered that one of the Fair Isle Backgrounds kind of look like tire tread, do you see it? Why is it that every time I say I'll be back tomorrow, I never am? I should stop saying that, maybe my posting would be more consistent!!! I'll share the card I spoke of yesterday tomorrow. 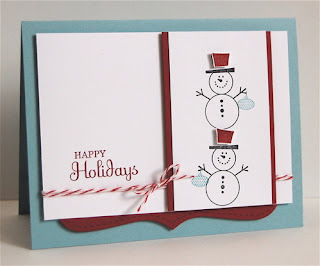 Today I have a card I made for the CAS Challenge at The Outlawz. Our DT member Pryn challenged us with a "Mission Embossible", she's so creative with her challenges. This card wound up being a triple challenge for me. 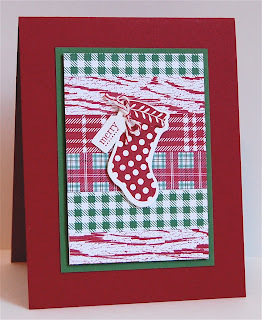 Not only is it embossed for The Outlawz, I also challenged myself to use Fair Isle Backgrounds to make a non-holiday/winter card. I've used it here to make a masculine birthday card instead. 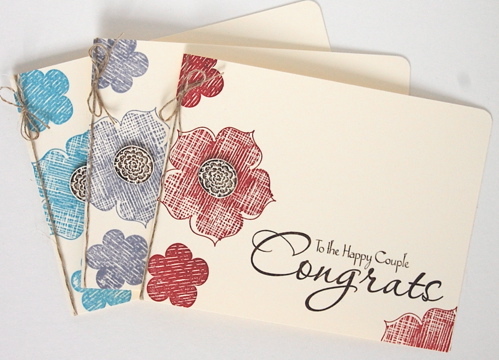 That strip of "patterned paper" was handstamped using Fair Isle Backgrounds and the masculine color combo of Cherry Cobbler, Crumb Cake & Not Quite Navy. I think I'll make another one, changing the colors, to make a feminine birthday card too. Gotta love versatility! Oh, and it just so happens my card also fits into the "Over the Edge" challenge at CAS-ual Friday's. Have a happy Sunday, enjoy the extra hour today. TGIF!!! Woohoo!!! We made it!!! 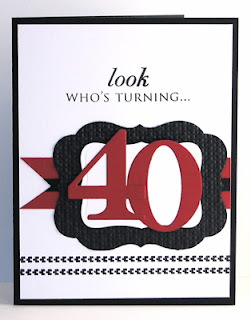 I had a fun morning stamping with friends, working on 40th birthday invites for a coworker of my husband's. I took a quick break to play around with this weeks Clean & Simple Sketch (FTL165). It's a bit of a loose interpretation. I changed the orientation and added some extras! 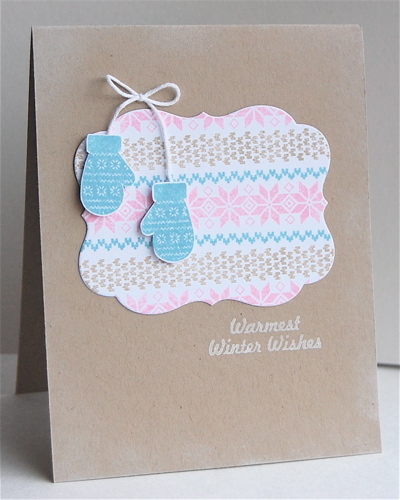 I used my wplus9 stamps again...Fair Isle Backgrounds, Winter Wishes and Christmas Wishes. I had the coolest discovery with Fair Isle Backgrounds yesterday while designing samples for the 40th anniversary invites I mentioned, I'll share that tomorrow :) See you then! Does this card look familiar? 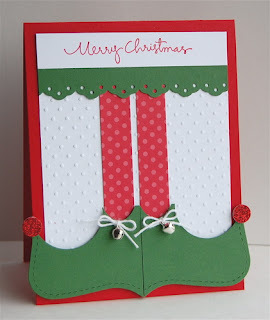 The layout is based on THIS card I made using wplus9 Christmas Wishes. Christmas Lodge is quickly becoming a favorite. The images are stunning alone and with just a bit of dazzling diamonds, this lodge just pops! I also used the Houndstooth Embossing Folder & Frostwood Lodge dsp which add to the whole country feel. I think I've mentioned before that I make cards for a local party store. The owner asked for some blank engagement cards that she could fill the inside with the services she provides. Since she asked for 20, I knew I had to come up with something simple for mass production! I think this card fits the bill. I made a few more in different colors in no time at all.